Why is there hesitation with regard to the application of heavy weight room intensities for the post-rehabilitated athlete and during an athlete’s in-season training? In my 30+ years of practice in the related professional fields of Orthopedic and Sports Physical Therapy as a Physical Therapist (PT) and Athletic Trainer (ATC), as well as the performance enhancement training of athletes as a Strength and Conditioning (S&C) Coach, I have witnessed and/or had discussions with many medical/health care professionals and S&C Coaches whom have expressed concern with regard to the application of heavy weight intensities in the training program design of their athletes. The concern for the application of heavy weight intensities usually transpires under the circumstances of either (a) the post-rehabilitation athlete returning to the weight room for their athletic performance enhancement training and/or (b) an in-season program design that includes heavy weight intensities as part of the (any) athlete’s weight room training. Some of these medical/health care and S&C professionals are leaders in their particular profession and the majority of these professionals demonstrate excellent knowledge and clinical skills; however, the concern for the application of heavy weight intensities upon the athlete during weight room training often remains the subject of controversy with the concern of possible injury to the athlete during heavy weight intensity exercise performance. Most professionals would agree that every athlete should be evaluated and treated as an individual, as some athlete’s may not be ready or in the occasional instance not be suited for the application of heavy weight intensities during weight room exercise performance. The evaluation of the athlete is critical in determining when the athlete is ready to resume their athletic performance enhancement training and/or return to in-season athletic participation. What are just as important are the preparation of the athlete prior to their participation in a performance enhancement weight training program, as well as the understanding by the medical/health care, S&C, and coaching professionals with regard to the distinctions of the various physical qualities necessary for optimal athletic performance. The physical quality of strength is the foundation of athletic performance as it is this particular physical quality from where all of other physical qualities derive. This physical quality also assists in injury prevention as demonstrated by the common application of strength enhancement type exercises as a component of the athlete’s rehabilitation program. This concept may be reviewed in my friend, Hall of Fame S&C Coach Al Vermeil’s Hierarchy of Athletic Development (Figure 1). At the time the athlete has been discharged from rehabilitation and cleared to return to their team’s off-season training program or in-season sport participation and training program, they (as well as any athlete) need to be prepared for the eventual necessary and appropriate application of heavy weight room exercise intensities required for optimal athletic performance. Often times the post-rehabilitated athlete is just placed into the team’s training program and this is where valid concerns may arise. Preparation also includes the development of the athlete’s work capacity as the volume of work prescribed must not induce excessive fatigue. Excessive fatigue will result in many negative influences upon the body, including but not limited to the deterioration of joint proprioception, lifting technique (mechanics), and muscle force output. The preparation of the post-rehabilitated athlete or in fact any athlete, as well as the development of an athlete’s work capacity is beyond the scope of this commentary, yet it is an important prerequisite prior to the initiation of the athlete’s participation in a formal athletic performance enhancement training program. 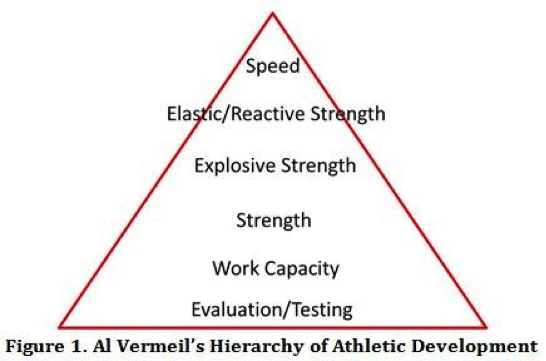 In review of Coach Vermeils’ Hierarchy of Athletic Development it is noted that strength is the initial physical quality and foundation for athletic development. One must also consider that there are specific standards of each various physical quality for each sport of participation, including the physical quality of strength, that are not only necessary for optimal athletic performance, but for the athlete to also participate on a “level playing field” so to speak when competing against the strength levels of their peers. Wouldn’t competing with a strength (or any physical quality) deficit when compared to the required physical standards of the sport of participation, as well as the individual whom the athlete is competing against not only place the athlete at a physical and athletic performance disadvantage, but possible risk of injury as well? It is also important to note that although the weight room training of the athlete may incorporate the principles and exercises of Powerlifting and Olympic Weightlifting to enhance athleticism, the S&C Professional is not attempting to make Powerlifters or Olympic Weightlifters of their athletes unless they are actually participating in these particular sports of competition. The professional should also consider how much strength is enough, for as the athlete’s strength levels increase; there is not only a point of diminished returns, but the inattention of the necessary training progression to emphasize the more advanced physical qualities of athletic development. As an example during the years I spent during the NFL off-season working with my good friend Hall of Fame NFL S&C Coach Johnny Parker and his players during his tenure as the Head S&C Coach of the NFL NY Giants, we also spent approximately 5 years training and studying with a former Soviet Weightlifter and Soviet Weightlifting Coach named Gregorio Goldstein. On one particular occasion when a NY Giant player named Dave Meggett had just squatted 425 pounds at a body weight of 178 pounds Mr. Goldstein was asked how to make Dave Meggett even stronger. His response was “you don’t need to make him stronger; you need to make him faster”. Mr. Goldstein had provided an “ah ha moment” as progressing Dave Meggett through Al Vermeils’ Hierarchy of Athletic Development would certainly be more beneficial to him as an athlete than to continue to attempt to establish a higher physical quality of strength alone. Now with that stated, before this progression of athletic development could occur; the NFL strength standard must not be ignored. When returning the post-rehabilitated athlete to their training and/or athletic competition, the integrity of their pathology as well as the associated anatomy should not be the only consideration. The athlete’s work capacity as well as the demonstration of their various physical qualities as compared to the standard physical quality requirements of the sport/competition should be a consideration as well. What are the standards of the physical qualities for athletic performance? Specific standards of the physical qualities necessary for each particular sport of participation, as well as the position played of that particular sport may be found with some effort made by the professional(s) working with the athlete. There are also standards for the achievement of the physical quality of strength prior to the progression of the athlete’s training to the more advanced physical qualities necessary for optimal athletic performance. For example many S&C Professionals are of the opinion the lower extremity strength levels required for the athlete to be successful in athletics is to back squat 1.5 to 2.0 times their bodyweight depending upon the size of the athlete, the sport of participation, as well as the specific position played. These strength requirements provide optimal levels of muscle force output for athletic participation as well as to prepare the athlete to safely progress to the advanced physical qualities of power, elastic/reactive strength, and maximal speed abilities. Maintenance of these strength levels assist in the prevention of their deterioration over the course of a long competitive season to assist in consistent on field performance as well injury prevention. Fry and Kraemer observed the differences in the physical qualities of strength and power when comparing Division I, II, and III level football players (Figure 2). If the results displayed in figure 2 are a consideration for the physical quality standards of athletes competing at various levels of collegiate football competition shouldn’t our post-rehabilitated athletes return to play at these same physical quality levels as not to place them at a disadvantage on the field of play as well as the risk of injury to a stronger opponent? One last factor to consider is that this study was published in 1991. How much stronger, faster and powerful are the collegiate athletes of today compared to those at the time of this publication? Why is the programing and application of heavy weight intensity necessary? The fundamental model of training as well as the ensuing adaptation process is derived from the “General Adaptation Syndrome” initially outlined by Hans Selye in 1936 and later refined by Selye in 1956. This fundamental model concept is also known in the literature as the “Supercompensation Cycle”. This stress response model (Figure 3) is initiated by means of an Alarm (Reaction) Phase as a (training) stimulus (application of stress) results in a disruption of the homeostasis of the body. The body then responds to the applied stimulus (Resistance Phase) by recovering and repairing itself while prompting a return towards the initial (homeostasis) baseline. 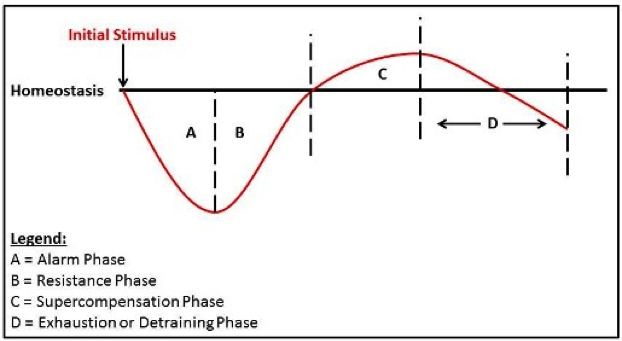 The Resistance Phase is followed by a period of “Supercompensation”, whereby the body adapts to the initial (stress application) stimulus by rebounding above the previous (homeostasis) baseline in order to better manage the initially applied disruptive stimulus should it present itself once again. The “Exhaustion” or “Detraining” Phase ensues with a reduction to the body’s initial level or below the level of homeostasis, as a result of an inappropriate application of a stimulus (too much, too soon, or inadequate). The application of unaccustomed stress (heavy weight intensity) in the weight room is necessary for adaptation to occur. If inadequate weight intensities are applied to the athlete, the athlete will enter the Detraining Phase of Selye’s model (due to an inappropriate application of an inadequate stimulus) and valuable time that may be utilized during the athlete’s training will be wasted as adaptation will not occur. Heavier weight intensities also assist to recruit motor units as well as the difficult type IIb fast twitch muscle fibers to encompass a greater contribution of the muscle during exercise performance, resulting in enhanced force output, rate of force production, and ground reaction forces. The application of unaccustomed weight intensity is also applied to the athlete during their exercise performance that occurs as part of their rehabilitation. Why would this philosophy change during the athlete’s weight room performance? Aren’t these unaccustomed weight intensities necessary in both the clinical rehabilitation setting as well as during the athlete’s weight room training? Heavy intensity weight room exercise performance is not only necessary for adaptation, but necessary to achieve the physical standards of the sport of participation, the progression to the advanced physical qualities of sport, as well as to ensure the safety of the athlete by not placing the athlete at a physical (strength) deficit when compared to their opponent. Injury rates that occur in the weight room are extremely low when compared to the injury rates that occur on the field of athletic competition. This is likely due to the athlete performing their weight room training in a controlled environment, which unlike the arena of athletic competition, places the athlete in an environment of chaos, an environment where nothing may be controlled. Why does there often appear to be a greater concern to return the athlete to a high stress weight room environment where the S&C Professional regulates the exercise selection as well as the application of appropriate exercise weight intensity and exercise performance volume, when compared to the return of the athlete to game day competition where there is absolutely no control of the application of some of the highest stresses the athlete will confront when placed in the environment of athletic competition? In discussions with medical/health care, coaches, and S&C professionals as well as the review of many in-season S&C programs, there also appears to be a concern with the inclusion of heavy weight intensities during the in-season training program design as the athletes are now also participating in both rigorous team practices as well as game day competition. One may inquire why during the athlete’s off-season participation in an athletic performance enhancement training program, maximal levels of stress (weight intensities) are applied, that often result in the athlete obtaining personal best efforts during their exercise performances. However, at the most significant time of the year, the time of athletic competition, the period where an athlete’s strength level is most important, there appears to be a hesitancy to include heavy weight intensities in the training program design. Some in-season program designs observed have failed to prescribe even 80% of the athlete’s personal best off-season weight exercise intensities. Thus this type of program design seems to be satisfied with the athlete retaining a 20% – 20+% personal strength deficit at the most important time of the year, the time of the competitive season. How does this training philosophy make any sense? Not only will a weaker athlete perform less than optimally on the field of play, but they will likely continue to lose strength as well as other physical qualities as the season progresses due to a consistent application of an inadequate stimulus applied over a prolonged period of time (the competitive season). The weaker athlete may now be placed at an increased risk of injury, as high stresses are continually applied over time via a season of team practices and game day competitions. This is especially true when facing a stronger and more powerful opponent(s). If heavy yet appropriate weight intensities are not applied during the in-season, how will the athlete maintain their required levels of strength? This philosophy was taught to me by Coach Parker over 20 years ago when he incorporated this same philosophy with his NFL players. Coach Parker called the in-season game schedule his “laboratory” as his teams played each opponent in their division twice throughout the year. An opponent may be initially played in September and then a second time in November or December. Coach Parker would comment on how his players were of the opinion that they were so much stronger than the same opponent at the time of the second game competition played later in the season. This was likely due to the fact that the NY Giants lifted heavy weight intensities during the in-season when perhaps their opponents did not. 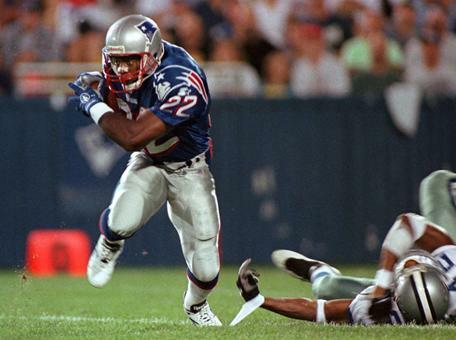 During his time as the Head S&C Coach with the NFL New England Patriots, one particular season as the team was entering the first round of the playoffs, 35 of Coach Parker’s players established a personal best in at least one if not more exercise performances. They won this initial playoff game and as well as others until their unfortunate loss to the Green Bay Packers in Super Bowl XXXI. Wouldn’t a coach want their player’s strength and power levels to peak at the most important time of the year, the playoffs? How can this possibly be achieved without the appropriate application of heavy weight intensities during the in-season training? 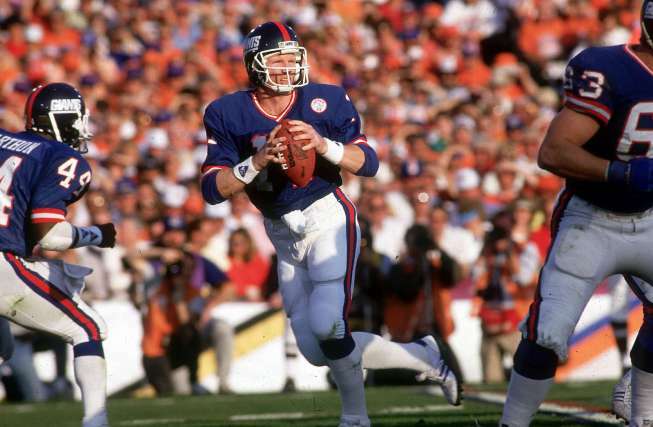 Another “in-season” training example is NY Giants Quarterback Phil Simms. Phil was an exceptional athlete who had a long and illustrious NY Giant career. Phil would perform his same off-season weight room program during the in-season as he felt the necessity of lifting heavy weights for his on field performance. If lifting heavy weight intensities during the in-season was to be a detriment to his career, why was Phil Simms able to play at a high level in the NFL for 14 years when the average NFL career is approximately 3.5 years? The addition of organized team practice and game day competition requires the volume of exercises programed as well as the volume of repetitions performed for each exercise to be properly adjusted. With a properly implemented in-season training program design consisting of lower exercise repetition volumes performed, excessive exercise fatigue will likely not occur. If excessive body fatigue does not transpire during the training process, why prohibit the incorporation of high weight intensity as part of the in-season program design? Although exercise volume and intensity go hand in hand, in my experiences, empirically it is the excessive exercise volume, causing excessive body fatigue that is usually the culprit to overuse type injuries, not the appropriately programed high weight exercise intensity for the athlete’s exercise performance. An additional consideration is that many coaches are of the opinion to often rest their athlete’s to keep them “fresh” so to speak. Although resting as well as “unloading weeks” are essential in the athlete’s program design, what is also important in keeping the athlete “fresh” as well as ensure a consistency of optimal athletic performance on the field of competition is the ability to keep the athlete strong. These high weight intensity program design lessons taught to me years ago are still implemented in both the rehabilitation and athletic performance training environment with the athletes with whom we work. The appropriate application of this philosophy has greatly benefited these athletes not only in their athletic performance, but to enhance the osseous and soft tissue structures of the body via Wolfe’s law and Davis’ law respectively. . When returning the post-rehabilitated athlete to the field of play the integrity of the injury as well as the anatomy associated with the injury should not be the only consideration for this decision. The athlete’s work capacity, the demonstrated levels of the physical qualities necessary for optimal athletic performance, as well as the particular sport’s standards of these physical qualities should also be considered as part of this decision making process. Not only will meeting these required strength levels assist to ensure the athlete’s level of performance, but likely assist in the prevention of injury as well. The athlete that competes with the presence of a strength or any physical quality deficit will likely be at risk of injury when considering the high stresses of a long practice and game day season, and especially when facing a stronger opponent(s). We surely do not have to make Powerlifters or Weightlifters of our athletes (unless they are Powerlifters or Weightlifters), but it is necessary for the athlete to exhibit the appropriate sport “standard” levels for the physical qualities necessary for athletic performance. These physical qualities can only be optimally enhanced and maintained via the appropriate application of a program design that includes high levels of exercise weight intensity. The post Why is there hesitation with regard to the application of heavy weight room intensities for the post-rehabilitated athlete and during an athlete’s in-season training? appeared first on Bret Contreras. The post Building Impressive Strength After 50 appeared first on Bret Contreras. The post Individual Differences: The Most Important Consideration for Your Fitness Results that Science Doesn’t Tell You appeared first on Bret Contreras. The post The Physical Effects of Progressive Strength Training: A Case Study With Tawna Eubanks appeared first on Bret Contreras.